Kalsi Engineering invests significantly in testing to better serve our customers. In many cases, this involves dynamic seal testing, but not always. We recently realized we were unable to advise our RCD seal customers whether a seal carrier has to have removable gland walls in order to permit damage-free installation of a KLS-brand RCD seal. Rather than leave this critical seal carrier design problem to our customers to solve, we designed a test fixture to find out for ourselves. 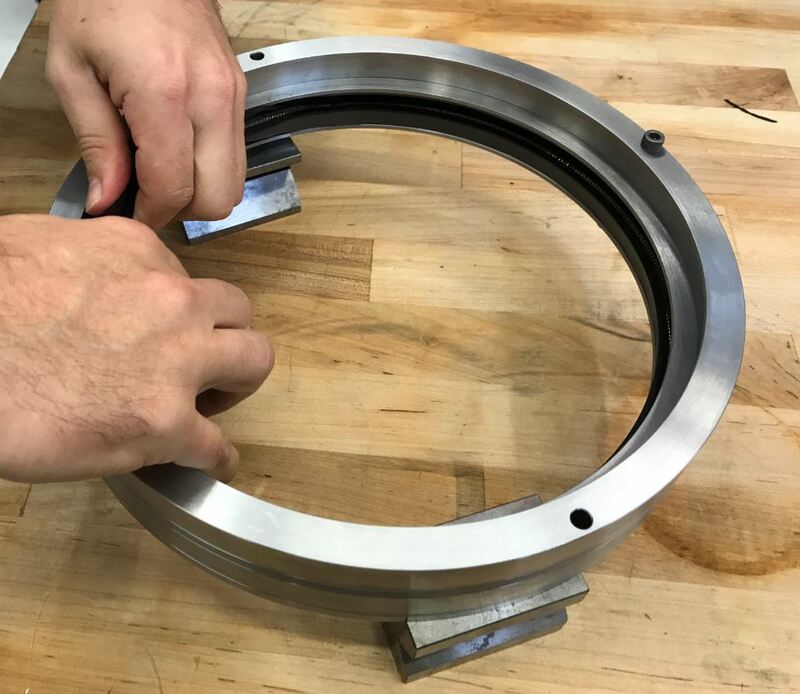 We selected the 9.75″ PN 668-18 seal to test, since it is currently the smallest RCD seal we offer. This seal selection makes the test results applicable to any larger diameter KLS seal. A drawing of the test fixture is included below. It consists of modular components that were bolted together with and without a spacer, to simulate various seal carrier axial widths. The spacer widths were 0.35″ and 0.70″. We were able to install the 9.75″ RCD seal past the recommended groove wall diameters without damage. The 10.260″ ID outboard groove wall is designed to prevent the dynamic lip of the outboard KLS seal from contacting the groove wall when the pressure of the barrier lubricant between the pair of seals is greater than the pressure of the outboard drilling fluid. This allows the outboard KLS seal to vent the hydrodynamic pumping related leakage of the inboard KLS seal. The 9.77″ groove walls are designed to support the KLS seals when high differential pressure is acting in the opposite direction. The installation test fixture does not incorporate certain features that are recommended for an actual RCD seal carrier, because the omitted features did not affect the installation testing. For example, we recommend that a small piston or diaphragm be used to balance the pressure of the barrier lubricant to the pressure of the drilling fluid. 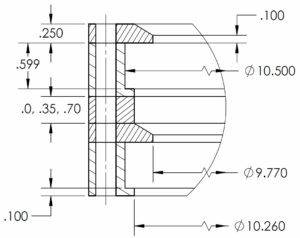 This requires that a radial pressure communication hole be included in the groove wall that is located between the KLS seals. 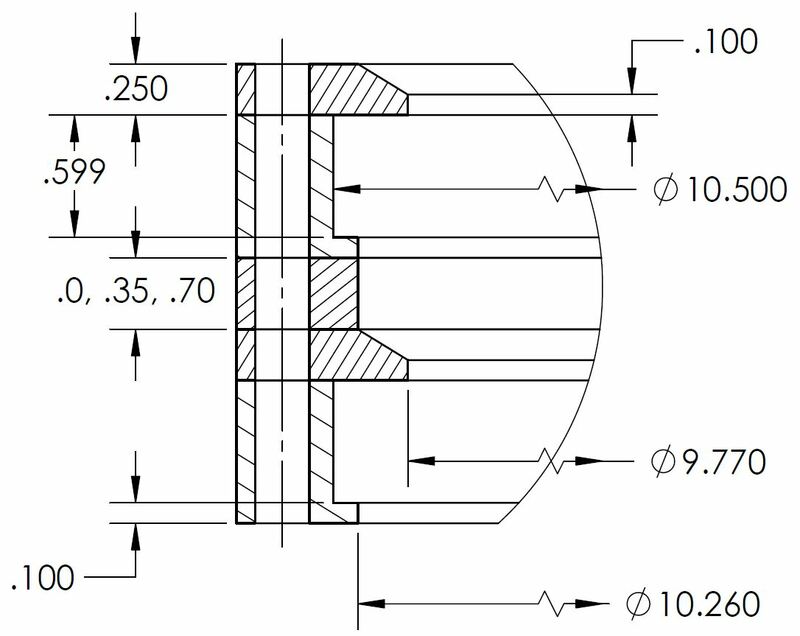 For another example, we recommend that if possible, a rolling element bearing be incorporated to provide radial guidance between the seal carrier and the rotating mandrel. When designing an RCD seal carrier, please contact us for additional information. This drawing shows the dimensions of the modular RCD seal installation test fixture. Installation testing was performed with the 0.35″ spacer, with the 0.70″ spacer, and with no spacer. This photo shows the KLS-brand RCD seal being installed into the modular carrier with the spacer omitted. The seal was installed without damage.